It’s important to remain hydrated with Cuban drinks while walking in the heat of Havana. Tap water can’t be trusted, so stick to the imported bottled variety which is available at all hotels and in Dollar stores and from Dollar kiosks. The widely-available soft drinks and wonderful Cuban fruit juices can be downed without worry. If you want to buy cheaper drinks with National Money, you can choose from fresh-squeezed guarapo or a delicious cold batido. It’s probably best to give a miss to the refrescos as they are overly-sweet and taste like watered-down Kool-Aid. But consider the refrescos naturales which are made from the skins of tropical fruits boiled with cane sugar. 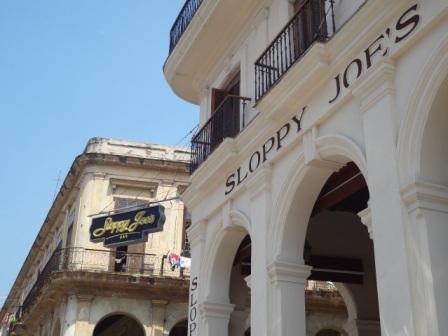 Cuban rum is world-famous and is served everywhere including the newly-renovated Sloppy Joe's bar in Old Havana. There are three types... white, gold and dark. The white is used as a mixer while the other aged varieties can be sipped and enjoyed on their own or over ice. You can buy a bottle of Havana Club from any state-run shop for as low as 5 CUCs.